I have an amazing resource to share with you! I’ve read this and think, dear reader, that this is guide is a gem that can save you thousands! If you are a fashion designer, design entrepreneur or maker launching a physical product then this is the guide for you. The lovely Liz Long, my recommended sourcing expert, has expertly written up The Complete Makers Guide. This 34 page, step by step manual demystifies topics like product development, supplier vetting & negotiating, and quality control. 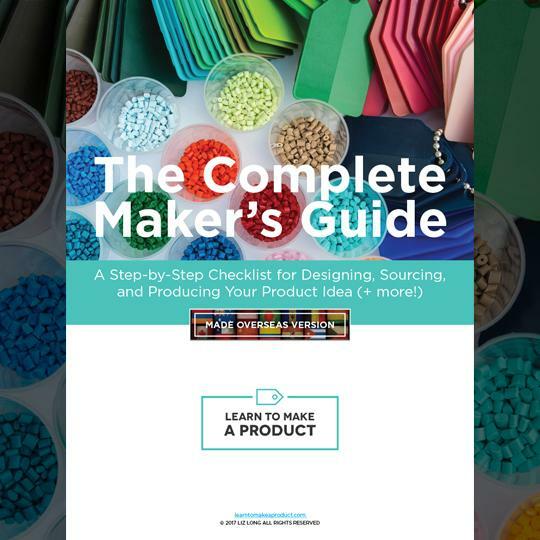 The Complete Maker's Guide is your one-stop resource for turning an idea into a sellable product. • How to contact suppliers, where to find them and a rock-solid vetting process. Apply the instructions in the Maker's Guide to a wide range of product categories, including apparel, soft goods, hard goods, home decor, furniture, jewelry, children's products, pet accessories, and more. This guide comes in two editions, made overseas and made in the USA. The Made in USA is a helpful planning tool if you plan to produce domestically in a different country of residence too.